ACR has finalized the schedule for the High Five III. Starting on October 29th and running thru the Halloween week end (Sunday Nov. 2). Daily Events will start at 3PM, 5PM, 7PM, 8PM and 9 or 9:30PM Friday thru Saturday. There is definitely a tournament for everyone, micro players, PLO players, Bounty hunters, 6 max players and turbo players. The Sunday Main Events will have start times of 3PM ($3.30, $1500 GTD), 5PM ($150K GTD), 6PM ($50K GTD), 7PM ($25K GTD) and 8:30PM ($7.50, $1300 GTD PLO KO). The schedule of satellites leading up to the High Five total over 16 a day on ACR. The High Five Tournament Series Returns to Americas Cardroom For a Third Time With $420,000 Guaranteed. San Jose, Costa Rica – October 21, 2014 – The High Five Tournament Series returns for a third time to Americas Cardroom with each one getting more exciting than the last. 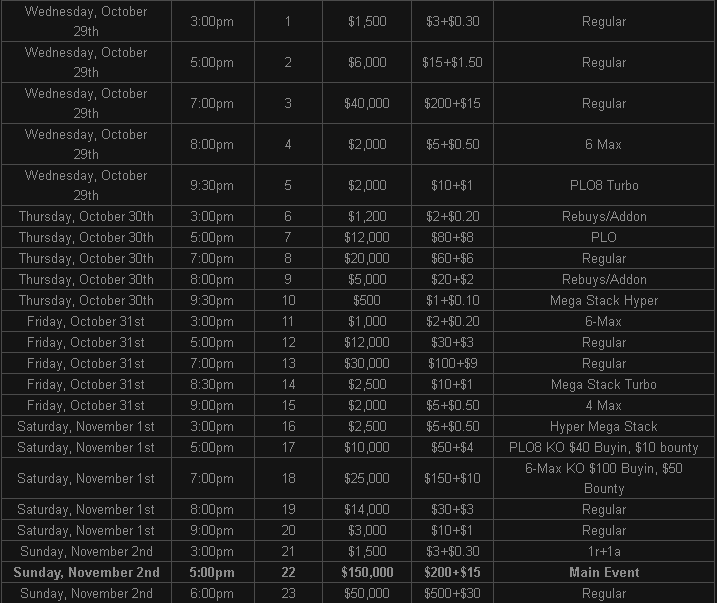 The tournament series has five events each day from Wednesday, October 29th through Sunday, November 2nd. The 25 events overall will have a guaranteed $420,000 in prize pools, with the Main Event accounting for $150,000 all by itself. Earlier in June, the second edition of the High Five series ran with $420,000 guaranteed and saw record numbers in most of the prize pools. The High Five features various games types like Texas Holdem, PLO8 and PLO, plus different formats including regular, rebuy/add-ons, turbos, knockout tournaments and hyper-turbos. Buy-in prices start at $1+$0.10 and go up to $500+$30, but players can qualify for FREE with one of the many satellites that are running now. On December 14th, Americas Cardroom is guaranteeing $1 million in Winning Millions, the first Sunday million-dollar tournament to hit US shores in nearly four years. Players can buy directly in for $500+$40 or find a low buy-in qualifier for just a few dollars. 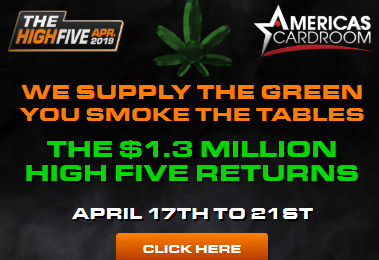 For the complete satellite schedule to The High Five tournament series and the $1 million guaranteed tournament, please visit AmericasCardroom.eu.